Just One Point Of View [justonepov.com]: Ford Escape Hybrid Tone Ring Repair - Yet Another Problem with the FEH Brakes! Ford Escape Hybrid Tone Ring Repair - Yet Another Problem with the FEH Brakes! During one of the recent very hot days in the Mid-Atlantic (100+ degrees Fahrenheit temperatures) my 2005 Ford Escape Hybrid alerted me to a problem with my brakes while I was traveling in normal traffic conditions. The alert tone sounded, the yellow ABS warning lit, and the information display informed me to "Service Brake System." With no cars directly behind me, I carefully tested my brakes and they seemed to operate as expected. The regenerative braking indicator showed that energy was flowing back to the high voltage batteries and the vehicle safely slowed down. Obviously, this was not another death-defying episode with a failed master cylinder and hydraulic control unit (Please see my previous blog posts: My Ford Escape Hybrid Brake Repair Experience - The Brakes Broke the Bank! and Ford Escape Hybrid Brake Failure - Revisited), so I carefully pointed the car towards home. But this was yet another problem with the FEH's brakes! What could it be this time? Since the brakes seemed to operate correctly, I directed my attention to the ABS (Anti-Lock Braking System). Recalling research from my earlier brake problems, I started by resetting the vehicle's computer by disconnecting the battery for a short time. That cleared the alarm, but a short test drive resulted in the problem quickly reoccurring. I understand that the ABS computer stores the failure codes for later review. If you have access to such a device, you will likely find the following codes: C1142 - Wheel Speed Sensor Right Front Tone Ring Tooth Missing Fault; C1234 - Wheel Speed Right Front Input Signal Missing; U2023 - Fault Received From External Node. However, with no ABS diagnostic code scanning device available to me, I resorted to a physical, visual inspection of the brake components. It didn't take long to discover the problem. There on the passenger side, front axle was a broken tone ring. So what is a tone ring? You may also find this component referenced as an indicator ring. This part is integral to the ABS. Coupled with an "electronic eye" sensor, this slotted ring is fitted to the axle at each wheel. The slots are used to send pulses to the ABS computer, indicating the speed of each wheel. Since this tone ring was cracked, one of the slots was larger than the others. This sends false information to the ABS computer, resulting in the brake system malfunction that I experienced. What I discovered is that in this situation, the brakes still worked. However the ABS is apparently disabled, resulting in a potentially dangerous situation. Why did the tone ring break? Good question. It is not a component that experiences any wear and tear; the ring is simply fitted to the axle at each wheel and allows the electronic eye to register pulses to determine the wheel speed. It appears as though corrosion (i.e. 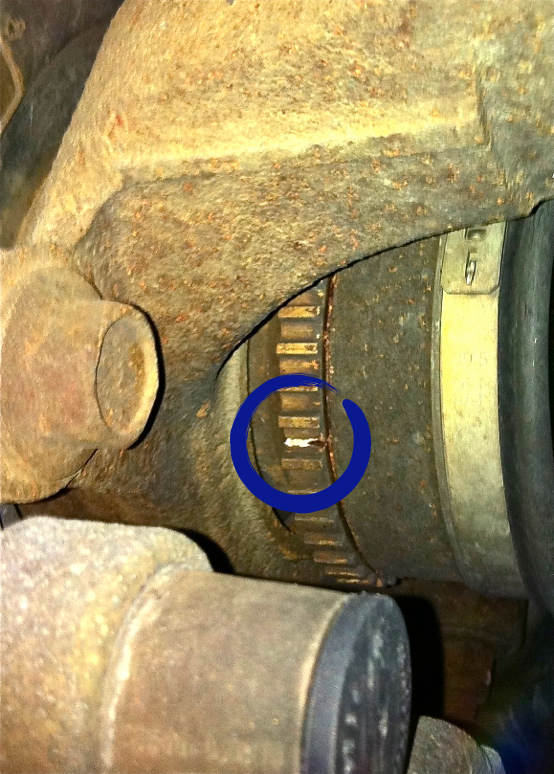 rust) between the axle and the indicator ring created enough pressure to force the ring to break. It's possible that the high ambient temperatures contributed to this failure by slightly expanding the size of the axle. However, based on my previous bad experiences with Ford's brake system design, I will chalk this one up to another poor component design; a potentially dangerous situation that never should have occurred! My research could not identify a technical service bulletin ("TSB") or recall notice associated with this issue, so if your warranty has expired, the repair is up to you. How can you repair the broken tone ring? I determined that it's not a particularly difficult project. However, it may be beyond the scope of some shade tree mechanics as it does require some tools that are not often found in the typical household toolbox. I'll provide the steps that I took to complete the work, but I will recommend that you enlist the assistance of a more experienced mechanic if you are not skilled in these types of repairs. I easily found the replacement part online at several retail sales websites. The original part number from Ford is 7L8Z-2C182-B. However, it has apparently been changed to AL8Z-2C182-A. You may want to try performing a search on both numbers in order to get the best comparison. Prices varied widely; I found that a single ring sold for between $7 and $35 (plus applicable taxes, handling, and shipping). I found what looked to be a reputable retailer that sold the "Genuine Ford Part" for about $15. It arrived just a couple of days after online purchase, so I was ready to tackle the project! To complete the replacement of this important ABS component, start by carefully blocking the wheels of your Ford Escape Hybrid, engaging the parking brake, and lifting the corner of the vehicle that has the broken tone ring. After placing jack stands (or some other kind of safety blocks) under the car, remove the wheel. Then remove the two bolts that hold the brake caliper in place. A generous application of penetrating oil on the fasteners you will be removing goes a long way towards making your life easier for these kinds of projects. Buy a can and you will be very grateful... I promise! After you have unfastened the brake caliper, you may want to carefully suspend it out of the way using a rubber strap / bungee cord to avoid placing too much stress on the hydraulic brake line; don't just let it hang there. Next, remove the brake rotor. This can be a challenge as the part is often temporarily fixed to the axle, adhered by time and corrosion. If you cannot remove the brake rotor after a couple of simple taps with a hammer, follow the helpful advice provided in this instructional video before you do something silly and break or damage your vehicle's brakes. Now remove the electronic eye sensor that is coupled to the tone ring and move it out of the way; a single, small fastener holds it in-place. Disconnect the tie rod and remove the two bolts that connect the hub to the suspension strut. You can conveniently leave the hub connected to the lower ball joint while you finish the repair. Now remove the nut connecting the hub to the axle. If the axle does not easily dislodge from the hub, you may need to use a gear puller (like I did) to push the axle out of the hub to get access to the tone ring. Allow the hub to lay to the side, out of the way, while you get down to business replacing the tone ring. Once the axle was free, the broken tone ring simply fell off the axle to the floor. Based on my observation, the area of the axle where the ring resided was slightly corroded and the original ring had only the one crack. The replacement ring looked virtually identical to the broken one (except for the crack!). It did not appear that Ford had done anything obvious to improve the design of the replacement part unless the metal alloy was somehow changed. The replacement indicator ring would not easily fit in-place of the original, so I cleaned up the surface area with a small die grinder with a sandpaper barrel bit. Use special care not to remove too much material, just the obvious surface corrosion. I found that the new ring would not simply slide into place, which I was glad to see since I wanted the new ring to have a nice and tight fit on the axle. I carefully heated the new ring with a propane torch; not too hot, just enough to expand the diameter enough so that it could be tapped into place on the axle with a small hammer. Once cooled, the ring appeared to be fastened tightly in-place. With the new tone ring installed, I proceeded to reassemble the rest of the axle and hub assembly, including the brake rotor and caliper. Once the wheel was mounted, I was able to remove the jack stands and lower the vehicle to the ground. A brief test drive in a safe area that allowed me to perform several hard-braking, quick stops, demonstrated that the ABS was working correctly and that the new indicator ring had resolved the problem. In the end, the repair process took less than three hours, including preparation and clean-up time. The total out-of-pocket cost was less than $20, including a fresh can of penetrating oil. Assuming the usual labor and shop charges, performing this repair myself must have easily saved me a few hundred dollars. I hope that these instructions may help you fix your own Ford Escape / Mercury Mariner Hybrid tone ring problems. If you have experienced this or any other issues with the brakes on your Ford hybrid vehicle, please file a complaint with the Office of Defects Investigation ("ODI") at the National Highway Traffic Safety Administration ("NHTSA"). You can file a safety complaint at this web site... http://www-odi.nhtsa.dot.gov/ivoq/ or by calling the NHTSA Safety Hotline, Monday through Friday from 8:00 a.m. to 8:00 p.m. at (888) 327-4236, TTY: (800) 424-9153. Maybe one of these days the NHTSA will have Ford address these potentially dangerous issues with the brake systems on their hybrid vehicles. I have 2007 FEH. My rings went out within 2 weeks of each other at ~ 98k miles in 2011. Axles from Advance Auto ~$54 I think. Too much work. Cheap repair: JB WELD and a large hose clamp. 3k miles later and no problems. Cost $0 I already had the JB WELD from another project. The larger slot does not cause the ABS failure; the problem is the ring slips. (Or in 1 of my cases, the ring is not in its original location.) If the ring is cracked, you can spin it with your hand. Procedure: Remove the wheel, not the caliber or rotor. Loosen the speed sensor and move up about 1/2 inch. Move the ring out of the way. Then use wire brush attachment to the end of a drill to clean most of the rust off of the axle where the ring was; not completely void of all rust. Coat the axle where the ring was with JB WELD ~1/32 inch and put the ring back and use the hose clamp to hold the ring in place while the JB WELD cures. Make sure the inside edge of ring is flush against the axle. Use a large screw driver to pry/push the ring flush when the hose clamp is tight. Cure JB WELD overnight. Remove hose clamp. Re attach speed sensor, put back on wheel. The extra gap where the ring broke does not give the ABS computer any problems. If you choose to replace the ring, another website suggests you seal the places between the ring and axle with super glue so moisture cannot get in and cause the failure again. Anonymous: Thank you for this novel approach to repairing the broken tone ring. However, I am not certain that I agree that the extra gap at the break does not cause a problem, as my broken ring was still "tight" to the axle and did not slip or spin. Yet I was still having ABS problems related to the broken ring. I would point out that you do not need to replace the entire axle (at $54 or more) as once suggested by many Ford Service Departments. You can purchase the brand new OEM tone ring alone for less than $15 and complete the repair in about the same amount of time, or less, than what you spent using epoxy to adhere the broken ring back in place. I stand by my replacement of the broken part as the preferred repair method (even though I love JB Weld!). Thank you for sharing your own repair experience. Just did my JB weld fix. Will let it sit overnight and see how things are. A lot cheaper than $200.00 plus dollars to have Ford replace. Update on my JB weld fix. Put everything back together and reconnected the battery (under the hold battery). 23 hrs total. When I 1st started it up, the ABS light was one and now the brake light was on now. Once I started to drive, the lights all went out. Drove around for 10 miles and brake hard a few times. Everything is now back to normal. Total cost of this fix for me was $7.53. Another update. The JB weld is still holding so far. 959 miles. Everything still normal. I would really like to thank "Anonymous September 19, 2011 12:20 AM" for suggesting this fix. It saved me a lot of money from the dealer who replaced a ring once before. This also saved a tear down to just put on a ten dollar part. Now if another ring breaks, I already have the JB and hose clamp. I have to agree that replacing the axle is a bit ridiculous considering the amount of work involved in that vs how the original poster decided to fix it. If you're going to replace a $54 axle why not just place a new ring on instead of jerry rigging the old one onto a new corrosion freee axle. We paid a whopping $18 to replace and repair both tone rings and did it in 3 hours instead of 23 with JB weld. Opting for a new part for our family car and a little manual labor in the hot sun was well worth the effort and cost. Great and very helpful ideas, none the less.